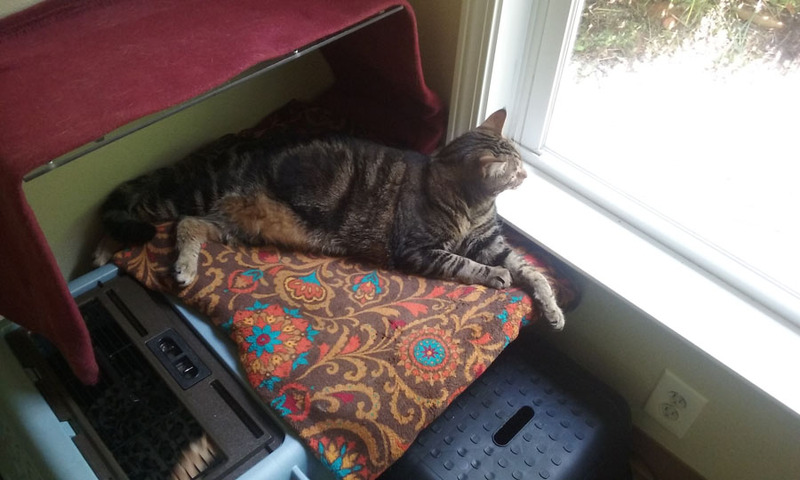 Cats Cradle resort, located near Asheville, NC, is an intimate and cozy cat boarding facility with 11 rooms, each about 4'X6' with a large window. Feline guests have the opportunity to feel secure with a place to hide, yet have the opportunity to come out and play in their room if they wish. They can jump up on ledges or sills, stretch and exercise, or otherwise strut their stuff, in contrast to cage-style kennels. And, they can come out of their rooms into the main common area at least twice a day to explore and play and sniff under the doors of other kitty visitors. We don't mingle kitties. Only cats from the same household can come out at the same time. The small number of guests and rooms enables us to give them individual attention many times a day, helping to keep them in good physical condition. The traditional notion of the independence of cats, true in many ways, ignores the fact that in their own way they miss their human families when they are apart from them, though they may not immediately show it (as a dog might do). They deserve more comfort than a cage and they deserve attention and some of the human affection they have become used to. 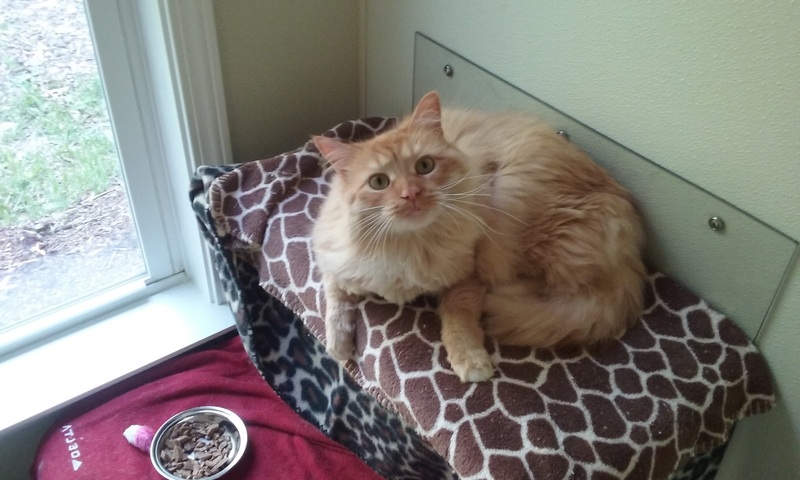 At Cats Cradle they have as many of the comforts of home as possible, as well as the love and cuddling time they may crave. Please bring any toys and bedding they may be used to. Owner/operator, Donna Chainas, has spent a lifetime caring for cats, both personally and professionally. Her years of experience include working at Blum Animal Hospital, a renowned facility in Chicago; volunteering at Friends of Gummi, a cat rescue shelter in Naples, Florida; cat-sitting for friends, neighbors and relatives throughout her life; working at the Animal Hospital of North Asheville for a short time; and years of caring for her own kitties. If your cat needs to be fed more than 2 times a day, or medicines administered with each meal, or you kitty needs extra attention, Donna can provide for their needs, because she lives on site and is just steps away from cat guests. We do have a restriction, however, no kittens under 5 months old. We want everyone who plans to board their cat to make an appointment to visit us and see the facility so that they can have peace of mind when the time comes to board their furry family member. Whether you're planning a vacation, a business trip, a remodel of your home; or an unforeseen event occurs and your cat needs a safe place to stay, we will do everything to ensure that Cats Cradle will be your kitty's home away from home. We hope to see you soon. We urge you to visit Cats Cradle before making a reservation. Please call us to schedule an appointment. We think it will give you peace of mind when it's time to board your furry family member. We can pick-up and drop-off your cat as needed. Please see our fee section for charges. Please provide as much advanced notice as possible for pick-ups and drop-offs. We will administer routine medications such as insulin injections, or tablets that can be crushed or liquid meds that can be mixed into food. SubQ fluids can be arranged in advance for $20 per administration. Please ask about other meds. Whether you're traveling on vacation or business, remodeling your home, or dealing with an unforeseen event that leaves your cat needing a caring place to stay, we will do everything to insure your kitty's stay is secure, pleasant, and peaceful. 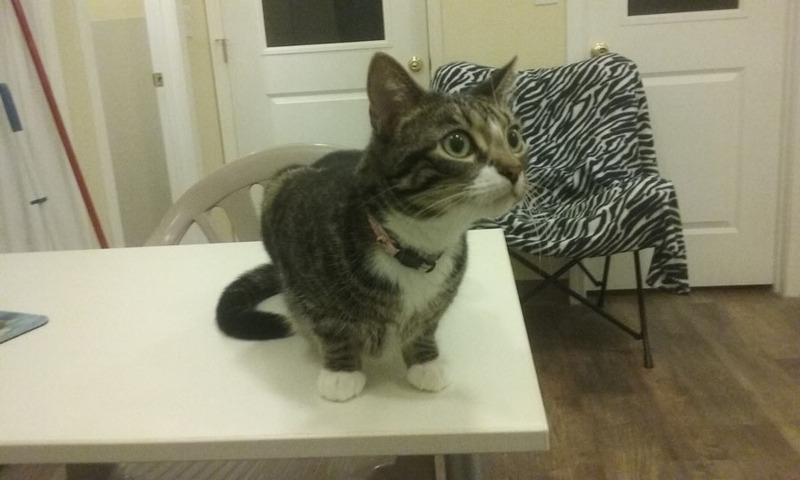 You can relax knowing that being a "serious cat person", Donna will give your cat personal attention if wanted, or space to carry on more "aloofly" if that's what kitty wishes. We are here for the cats and respect their wishes. It's all about them. Visiting cats enjoy their own bright and airy rooms and a "bird's eye view" of the out-of-doors through the large window in their room overlooking a garden setting on Quiet Creek. The setting provides a peaceful view of birds flying in and out of trees and bushes, butterflies, squirrels, and other critters like raccoons, possums and lizards scurrying around the outside garden. Maybe even a turtle or two. Each suite has a comfy bed, a hiding nook, a padded ledge to perch on, toys, and a litter box that is scooped out at least twice a day. Cats can be viewed at any time through the screen in each interior door.